Around East England Region we have auction rooms in Norwich, Ipswich and Kings Lynn. Sell By Auction covers East England and East Anglia regions. Including Bury St Edmunds, Peterborough, Cambridge, Great Yarmouth, Norfolk & Suffolk. Extensive regional coverage from multiple auction rooms and seven sales per year provides plenty of choice for our selling clients such as yourself. You are only 4 to 7 weeks away from securing an exchange of contracts and fixed 28-day completion of sale. Combined with selling at best price from all buyers in the marketplace. Selling By Auction is fast, reliable, simple and stress-free. Arrange a free auction consultation today. I live in the house I want to sell by auction, what about viewings? 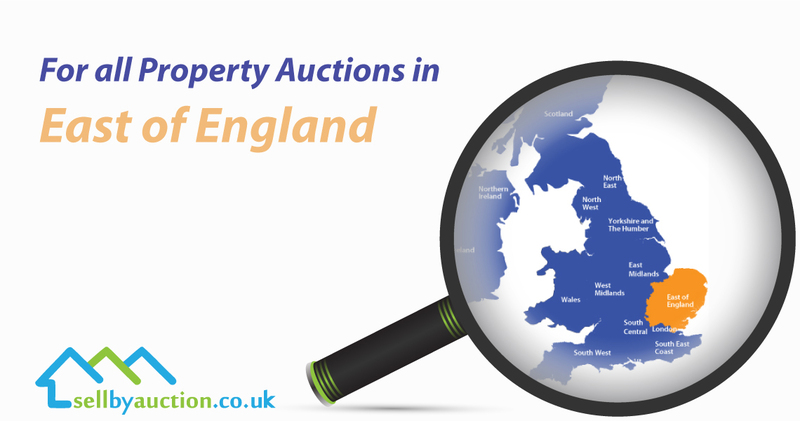 Most East England Property Auctions houses sold at auction are vacant, so access for viewing is easy. In some cases, tenants live in the property, viewings may or may not be possible, depending on the relationship between tenant and landlord. When it comes to selling a property by auction where the owner still lives there, property auctioneers recommend one of two options to ensure potential buyers get the viewing access they need and to minimise disruption to the occupiers. We can agree with the seller a series of fixed open house viewing days. We will advertise these times and dates and publish them in the auction catalogue and online. Our team will attend the property on each viewing. Viewers are registered and accompanied around the property, giving ample opportunity for the buyer to ask any questions about the Lot being offered, and buying at auction. Open house viewings for a property being auctioned around East England and East Anglia is a great way for the local auctioneers to establish how much interest there is in the house. The homeowner can be present during the viewing or go out for a while as its totally up to you. The homeowner conducts the viewing on a first come first served appointment basis. While convenient and comfortable for the potential buyer – they get to view on their own and at a time and day of their choice. It does cause maximum disruption to the seller. Keep in mind that most properties ready for auctioning off attract substantial numbers of viewers, far higher than through an estate agents around East of England. To give you an idea, we regularly show 20-40 people around a typical Lot, and 100 plus viewers aren’t unusual on a desirable lot. That’s the power of selling by auction which you can take advantage of. Buyers love buying at auction for the ease, transparency, certainty and security of sale, neither the seller nor the buyer is waiting around for months while lawyers slowly grind through the paperwork, during which all parties risk a chain collapse. One in three open market sales fails to perform. Sale by auction secures an exchange instantly on the fall of the gavel.